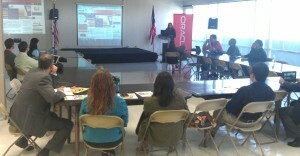 As part of the recent alliance between HETS and Oracle, they celebrated on March 20, its first event in San Juan, Puerto Rico. The conference/brunch with technology leaders and faculty was hosted by EDP University in Hato Rey, Puerto Rico. Participants from Huertas Junior College, Caribbean University, Carlos Albizu University, ICPR Junior College, Universidad del Turabo (AGMUS) and EDP College had the opportunity to exchange ideas with Ms. Aurora Roque, Customer Care Manager for Oracle Academy. Ms. Roque also shared with the participants the advantages and opportunities that Oracle Academy offers to their institutions and its compromise with Education and HETS members. During the brunch, after the conference, attendees had the opportunity to interact with colleagues, share learning experiences, and learn new trends in educational technology, innovation and quality in Education. A copy of the event presentation is available at the following link: HETS/Oracle Academy Presentation. For more information about Oracle Academy, please contact the HETS office to help you coordinate a meeting with Ms. Aurora Roque from Oracle.